If your kids are like mine they can get wild and crazy in the playroom. I know my kids have gotten lots of bumps and bruises when they hit the corner of the ping pong table or bumped into one of the wooden shelves, but when they take those flying leaps onto the bean bag chairs there’s no way they can get hurt…that’s the first reason bean bag chairs are my #1 pick when it comes to kids furniture for playrooms. 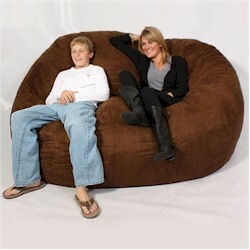 Reason #2: Bean Bag Chairs today are so stylish and comfy, much more so than the bean bags of our past. I especially love the ones by Comfort Research because their bean bag chairs come in all kinds of colors, themes and sizes including chairs that fit one person or multiple people. Reason #3: Bean Bag Chairs are light weight and easy to move. If your kids want more floor space to play twister they can pile the bean bag chairs in the corner then easily move them back when it’s time to chill out after playtime is over. Reason #4: Comfort Research bean bag chairs are very kid-tough, so kids can jump, roll and dive all over these chairs and they’ll stay looking new and filled with beans. If for some reason the chairs lose their fluffiness, Comfort Research offers bean refills, so it’s easy to refill the chairs if needed. Reason #5: Bean Bag Chairs can be used anywhere in the house, so if guests come over for movie night you can move those chairs into the familyroom to give everyone a comfy seat. Basically, there’s absolutely no reason that bean bag chairs wouldn’t be the perfect choice of kids furniture for a playroom! I certainly can’t think of any!